Let me preface this post by telling you that I am one of the least spiritual people you will ever meet. I once (once!) attended a service at a Universal Unitarian church and when a stranger asked me about my ‘faith journey’ I turned inside out, fell on the floor, and slithered to my car like an embarrassed sea cucumber. My feelings towards Krista Tippett are such that a friend once gave me her book as a gag gift, in much the same way you’d give a vegetarian a ‘Meat Of The Month’ membership. I’ve always viewed religion and spirituality as a bit of an all-or-nothing game. Either you Believed In God or you didn’t. Either you burned sage and read tarot or you rolled your eyes over horoscopes. Only the here and now or … not. So what does that, like, mean? How does someone – religious or not, spiritual or not – create a contemplative practice? You can meditate or center your mind on a single concept. You can quiet your mind by weeding the garden or making dumplings or changing the oil in your car. You can simply commit to spending the day alone, without speaking. You can visualize the future you want for yourself or someone you love. You can create a Pinterest board of the wedding/business/trip you want. You can choose to reconsider an experience in a new light – you can choose to see the impermanence of your own opinions or interpretations. You can meditate with sweet, kind thoughts towards yourself, your people, or people who challenge and try your patience. You can make music or art. You can journal. You can create dance moves to the new Drake song in your living room. You can take an improve class or sketch a new landscape plan or make a jelly bean mosaic of Dolly Parton. You can make a pilgrimage to a place where social justice issues are highlighted – The Lorraine Motel in Memphis or The Stonewall Inn. You can work or volunteer in support of a cause that’s important to you. You can take part in a vigil or a march. You can bear witness. You can donate money. You can organize a group to talk about things that are important to you – the environment, parenting, the arts. You can open a dialog with community leaders. You can listen – carefully, closely, without judgment – when people share their story. You can share important stories. You can yoga or qigong or Aikido your heart out. You can practice walking meditation. You can go to a Pure Barre class with your best friend or run through the mountains as the sun rises. You can swim out to an island or row yourself to shore. Our lives contract and expand in direct relation to our intentionality. Click To Tweet Life opens up when we actively consider what we’re doing and why we’re doing it. A full (and fulfilling) life doesn’t necessarily require church or prayers or crystals or vision boards. All it requires is that you pay attention. What’s your relationship with faith and spirituality? 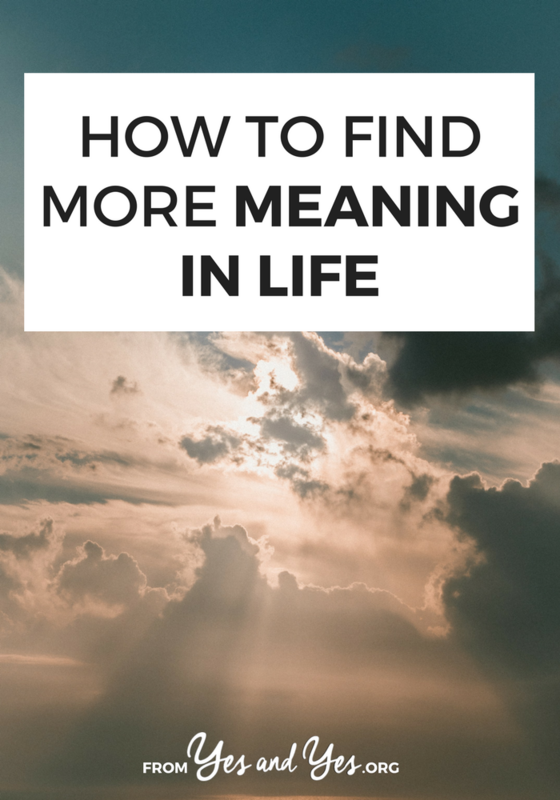 How do you add meaning to your life? Do you have any rituals or practices that you’ve found particularly meaningful? Give Self-Deprecation A Break Today. Add Your Honest, Unvarnished Proud Moments Here. Absolutely beautiful. I’m all about intentional living! I love the idea of not-necessarily-religious contemplative practices. I love the Ignatian Examen (here – http://www.ignatianspirituality.com/ignatian-prayer/the-examen ) – it obviously comes from a Catholic source, but minus “feel the presence of God,” I think it’s a great tool to practice intentionality and gratitude. I became disillusioned with the political machinations I experienced in “organized religion”. Now, I use a daily 4-step practice helpful in aligning with the world and with the power of unconditional Love. At the end of the day, I journal what worked; what didn’t work; strategies for improvement; and things for which I’m grateful. I feel more focused, and also more serene, since starting this practice. Barbara, I looove that! I’ve been a long-time gratitude journaler (and I even do #churchofgratitude on Instagram every Sunday) but I’ve never thought of adding those other three steps. So good! This topic is so interesting to me because it’s an area of my life I just can’t quite figure out. I was raised Catholic but I would not say my family was very religious. I would call leaving behind that religion more of a realisation than a decision. I just didn’t believe in God, and that was that. I eventually came to describe myself as pagan and became involved in my local pagan community. Howver, recently I have been noticing that I don’t think I truly hold to those beliefs anymore either. My counsellor told me people who believe in a higher power are more happy/at peace with the world. But I can’t just decide to believe in something. Lately I have been thinking that something like the practices you talk about in this post are the way forward for me. It’s great to hear from someone who separates them out from faith. I believe there’s a higher power and there are infinite ways to connect with that higher power (wouldn’t the infinite be infinite? ), so I think it’s important for each person to figure out what works for them. You have a lot of great ideas for different spiritual practices! It’s important to remember that spirituality isn’t just for Sunday mornings or whatever, that you can bring simple presence into everyday experiences. Great article! This was a spot on read for me. I have been discussing similar topics with my friends lately and I just couldn’t agree more with what you wrote. Love following your blog, Sarah!